Thomas Gooden is the Chief Compliance Officer (CCO) of Cornerstone Wealth Management, LLC. Thomas is responsible for compliance and supervisory functions, including the monitoring of activities to ensure compliance with our firm’s Code of Ethics. Thomas has been in the financial industry for 25 years. 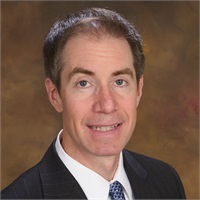 Previously working with Edward Jones, Thomas joined Cornerstone Wealth Management as an investment advisor in May 2012. At one point a corporate trainer, Thomas applies his teaching skills to explain investment strategies in simple to understand terms. "While my clients may not wish to become investment experts, I firmly believe it's in their best interest to understand enough to make informed decisions. I start by getting to know the person then focus on their goals, including saving for college, retirement and protecting against the unexpected." Thomas is a native St. Louisan and graduated from the University of Kansas where he and his wife, Mona, met. They have two daughters, Caroline and Allyson, and a rescue dog named Cora. He is an avid runner and cyclist and raises money for charities though running/cycling events throughout the year. Series 7, 24, and 63 securities registrations held with LPL Financial. Series 65 registration held with Cornerstone Wealth Management. Click here to learn more about Guided Wealth Portfolios.